Craig Powers is an industry veteran with more than 15 years of experience working with foundation problems and providing long-lasting solutions to homeowners. Craig has completed comprehensive training in designing solutions for crawl space and slab foundations. Craig was born in the Northeast and eventually moved to Texas. After several years spent in different aspects of construction, such as roofing and remodeling, Craig got involved in the foundation repair business by taking over a company that subcontracted work from other foundation repair companies in the Dallas-Fort Worth area. When these subcontractors demanded that quality of workmanship be sacrificed to complete jobs faster, Craig decided that the company's business model needed to change. He believed the customer deserved top quality repair, regardless of how long it took, at a price that was fair. He decided to offer homeowners the same quality foundation repair sold direct, instead of through a middleman. Craig makes it his personal responsibility to go above and beyond to satisfy each customer on every job. 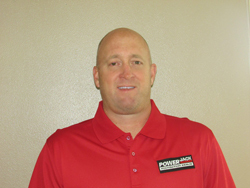 He is proud of his Power Jack Foundation Repair's strong dedication to customer satisfaction. Power Jack Foundation Repair is one of the most experienced and trusted foundation repair contractors in Texas, specializing in foundation stabilization for residential and commercial buildings. As a Supportworks dealer in Dallas-Fort Worth Metroplex, Power Jack Foundation Repair offers our customers proven, engineered foundation pier systems and repair products, backed by the commitment of an honest and reputable locally-owned company. Here at Power Jack Foundation Repair, our mission is to strive for excellence by offering the highest quality, state-of-the-art foundation repair products and techniques. We always place the integrity of the structure and the needs of the customer front and center in our day-to-day operations. Power Jack Foundation Repair believes in quality and excellence in everything we do; we depend on our people to apply these core beliefs on every project we work on. The people at Power Jack Foundation Repair are the most important resources we have in our company. You can depend on their training, knowledge and consideration when working on your home. Every home and foundation problem is unique and our staff will treat it as such – no exceptions. See how we helped the Wounded Warrior Project by donating a new foundation for a veteran's home. Power Jack Foundation Repair is a long-time supporter of the Wounded Warrior Project, as well as many other charitable organizations and events within our community. Wounded Warrior Project serves veterans and service members who incurred a physical or mental injury, illness, or wound as a result of their military service on or after September 11, 2001. The project provides free programs and services focused on the physical, mental, and long-term financial well-being of this generation of injured veterans, their families and caregivers.